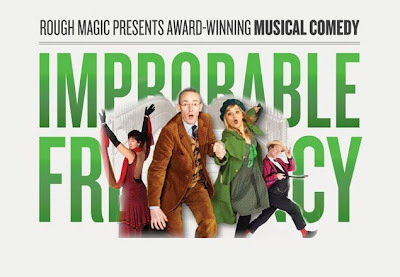 'Improbable Frequency', the award winning hit comedy musical, returns to the Gaiety Theatre from March 13th to 24th. 2012. Produced by Rough Magic Theatre Company, written by Arthur Riordan with music from Bell Hellicopter, the hilarious comedy follows the exploits of British codebreaker Tristram Faraday’s during a secret mission to Dublin during WWII as he investigates suspicious radio broadcasts. Before long, he is drawn into a morass of intrigue and deception that involves overthrowing the British, undermining the Nationalists and subverting the forces of nature. As the name might suggest there are many an improbable encounter along the way, with the likes of John Betjeman (the English Poet moonlighting as a spy); Nobel Prize physicist Erwin Schrödinger (Radio waves, sub-atomic theories and and the laws of probability are all central to the plot); Myles na gCopaleen, the surreal Irish Times satirist; and Agent Green, and old flame of Tristram’s and fellow spy and crossword. In order to avert disaster and perhaps impress the lovely Philomena, Tristram will have to draw on his uncanny ability to solve crossword puzzles and his ...... well, that’s pretty much all he can draw on actually. Tickets are on sale from here - from €15 to €49.50. A great night guaranteed! The Frog Blog is giving away two tickets to the (official) opening night of 'Improbable Frequency', on Thursday March 15th 2012 in the Gaiety. To be in with a chance simply tweet a link to this post on twitter - make sure @TheFrogBlog is mentioned! (or if you don't subscribe to the "twitter machine" just leave your name and email address in the comment box below). The winner will be announced on Friday! count me in - would love to see this.